If you want to donate to charity this holiday season and need a little inspiration, here’s a heart warming story about an Ohio State University professor. 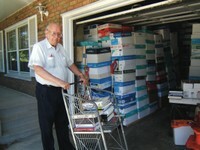 Over the past 30 years, 78-year-old Herbert Ockerman estimates he has donated $500 million in books to over 300 different locations worldwide. The books he donates are those that would be appropriate for a school or university library. He collects textbooks from a variety of disciplines, including math, philosophy, and medicine. Ockerman buys used books and accepts donations from used bookstores, OSU, and his fellow professors. He stores the books in his garage until he can ship them to where they are needed, whether that is in the US or an international destination. One shipment is usually around 36,000 books. During the many years Ockerman has been doing this work, he’s picked up a few awards, including the 2010 Distinguished Diversity Enhancement Award from OSU. Read more about this wonderful project in this article from The Lantern.